The Economic Development Partnership of North Carolina (EDPNC) is inviting local economic developers from every county in the state to an event examining five building blocks necessary for rural communities to capitalize on the state’s economic momentum. 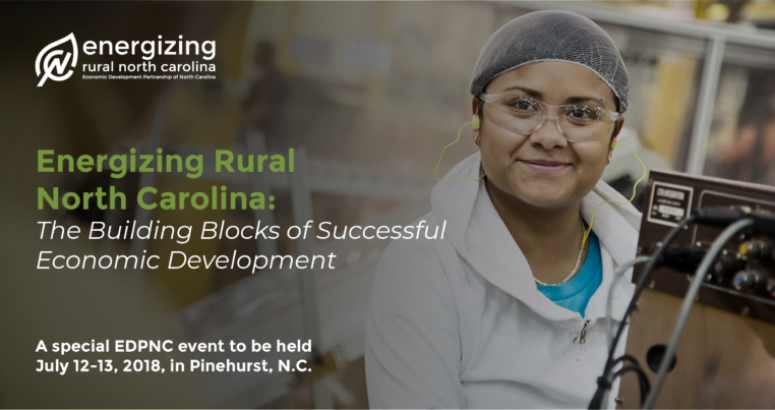 “Energizing Rural North Carolina: The Building Blocks of Successful Economic Development,” to be held July 12-13 at The Carolina Hotel in Pinehurst, will explore how infrastructure, workforce, education, health and leadership shape economic outcomes in rural communities. The goals of this first-time, invitation-only event for the EDPNC, which works on the state’s behalf to recruit new companies to North Carolina and support the growth of existing industry, include raising awareness of the building blocks, sharing case studies and best practices, and leaving participants inspired to pursue and collaborate on actionable economic development strategies within their own rural communities. North Carolina Gov. Roy Cooper is scheduled to speak at the event, which the EDPNC is presenting in partnership with the North Carolina Department of Commerce, the NC Rural Center, the Golden LEAF Foundation, the Institute for Emerging Issues at North Carolina State University and the North Carolina Economic Development Association. The EDPNC board’s rural working group, which is coordinating the event, formed soon after Cooper appointed Frank E. Emory Jr. chairman of the board in May. Emory charged the group with finding new ways the board and the EDPNC could support rural economic development ‒ beyond the work already being done by EDPNC’s statewide and regional staff. The event will examine how infrastructure, workforce support, education, health outcomes and leadership can contribute to long-term economic development results including employment growth, new business establishments, higher household income and greater economic output. Local economic developers from all 100 North Carolina counties, including the 80 defined as rural by the NC Rural Center, are invited, with each asked to bring up to three guests who are local influencers who can effect change in their communities. Participants will hear from subject-matter experts and local leaders who have had success within each of the five building blocks, then break out into roundtable discussions about assets, needs and possible strategies within their own rural communities. The focus on the five building blocks evolved from Hawkins’ firsthand experience as a Transylvania County commissioner over the past 14 years. “I’ve spent a good part of my adult life dealing with these issues in rural communities,” Hawkins said. Hawkins and the six other board members in the rural working group sought feedback from event partners on the choice of building blocks. EDPNC research staff reviewed literature and studies, concluding that when aligned with a rural community’s existing assets, the building blocks can promote economic development. After considering a number of possible event locations, the group chose Moore County because of its rural roots and central location encouraging participation from across the state.